With inflation getting to a 14-year low of 0.44% and with possibility of interest rates going down further, this probably might be the right time to buy a home. The next step in this quest to offer low cost housing will probably be to take the Laurie Baker [en.wikipedia.org] route. 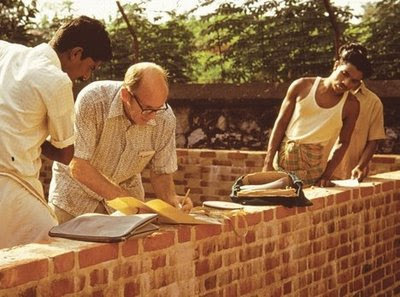 Laurence Wilfred "Laurie" Baker (March 2, 1917 - April 1, 2007) was an award-winning British-born Indian architect, renowned for his initiatives in cost-effective energy-efficient architecture and for his unique space utilisation and simple but beautful aesthetic sensibility. 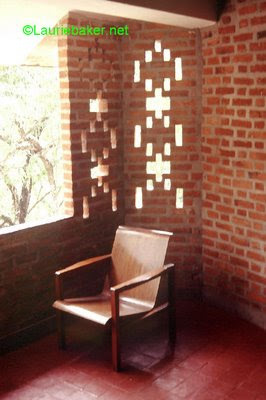 A few photos from Official Website of Architect Laurie Baker .. I had first read about Laurie Baker during my school days (pre 1996) in what was yet another essay in the Manaroma Year Book 199x. Was impressed with how he was able to build wonderful structures, including those with multiple floors, with just local materials and in effect coming up with utlra-affordable homes. May be builders (and their architects) can work to come up with some eco-friendly township of independent villas, using such techniques. Builders : No Price Cuts Planned ! !